Delegates from Rotary’s 532 districts, meeting for the 2013 Council on Legislation in Chicago, approved a $1-a-year increase in per capita dues, removed limits on e-clubs, and changed the name of the Fifth Avenue of Service to Youth Service. They approved resolutions asking the Board to consider allowing grandchildren of Rotarians to be eligible for Rotary Foundation programs, and to waive the rules for Rotary grants so that family member of Rotarians affected by a natural disaster would be eligible. During the week, the delegates considered more than 170 pieces of legislation that addressed the policies that govern Rotary International and its member clubs. The council is made up of delegates from all 532 districts around the world and is held every three years. Past District Governor Jerry Venters, a member of the Kansas City Plaza Club, served as the District 6040 delegate. The council approved a US$1-a-year increase in per capita dues that clubs pay to Rotary International, starting in 2014-15. The increase was proposed by the RI Board based on a five-year financial forecast if there were no dues increase, RI’s deficit would grow to $9 million in 2018 and reduce the General Surplus Fund below the level required in the RI Bylaws. With the dues increase, the deficit will fall to $5 million in 2018, according to the forecast, and the surplus fund will then stand at $88 million, above the mandated level. Supporters of the dues increase maintain that it will be sufficient to keep pace with inflation without necessitating cutbacks in service. Dues are the primary source of funding for Rotary’s operations. The Council action raises Rotary clubs’ annual per capita dues paid to RI to $54 in 2014-15, $55 in 2015-16, and $56 in 2016-17. Dues for 2013-14 are $53, and they have increased $1 a year for the past three years. · Approved a measure creating the office of vice governor, who would fill in if the governor becomes unable to serve. The vice governor would be selected by the district's nominating committee from among the district's past governors. · Increased the number of clubs that can take part in pilot projects to 1,000, up from the previous limit of 200. The RI Board uses pilot projects, which last for up to six years, to test new ideas, methods, and organizational frameworks for clubs. Pilot clubs that take part in these experiments are fully functioning Rotary clubs that are exempt from some requirements in the Standard Rotary Club Constitution. · Approved a measure allowing Rotarians outside the United States and Canada to receive an electronic version of their official Rotary regional magazine, if one is available. 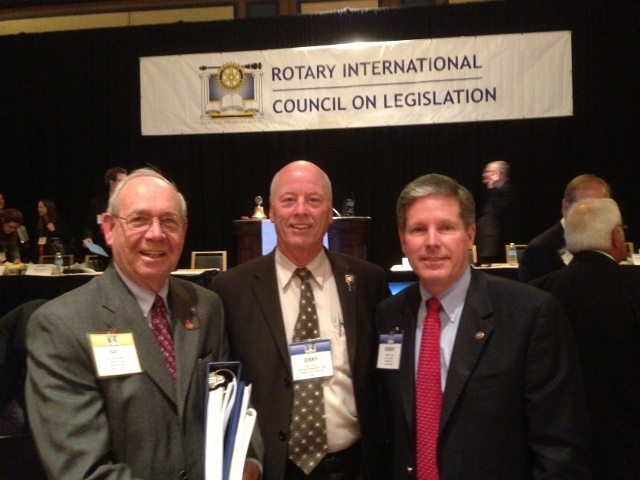 Rotarians within the United States and Canada were allowed the option of receiving a digital version of The Rotarian by the 2010 Council. · Approved changing the name of Rotary’s Fifth Avenue of Service, currently called New Generations, to Youth Service. The 2010 Council on Legislation approved this avenue of service for youth, which joined Rotary’s Four Avenues of Service (Club, Vocational, Community, and International). The name New Generations was meant to reflect the need to build up the next generation of Rotarians, but proponents of the name change argued on Wednesday that the word “youth” is more universally understood, both inside and outside Rotary, and clarifies the fact that these programs encourage Rotarians to empower youth. · Approved allowing a district to have an unlimited number of e-clubs, removing a previous restriction of two e-clubs per district. E-clubs meet electronically, conduct service projects, and sometimes also hold in-person meetings. · Approved a measure, aimed at increasing membership, that provides for satellite clubs, whose members meet at a different time and location from their parent club but who are also considered members of the parent club. · Approved a measure allowing participation in club projects to count toward club attendance requirements. The measure amends the Standard Rotary Club Constitution to provide that a member must attend or make up at least 50 percent of club regular meetings or engage in club projects for at least 12 hours in each half of the year, or a combination of both. · Removed the travel reimbursement policy from the RI Bylaws. This will enable the RI Board of Directors to develop a policy that is flexible, able to address emergency travel situations, and able to take advantage of cost-saving opportunities. · Defeated two measures that would have allowed clubs to meet less frequently. The delegates also rejected a measure that would have allowed a club to cancel six regular meetings a year instead of four, for holidays, the death of a club member, disasters, or other emergencies. · Rejected several resolutions that would have asked the RI Board of Directors to grant official recognition to programs that serve a range of different age groups, including EarlyAct, KidAct, and ElderAct. Full information on the Council’s proceedings can be found on the RI Website, www.rotary.org.